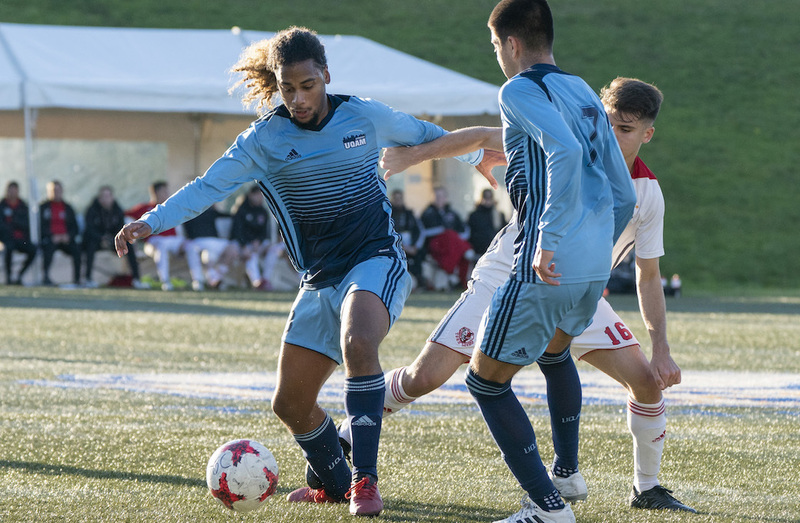 A first-half marker from Malick N’Diaye proved to be all the UQAM Citadins needed in Saturday’s fifth-place matchup at the U SPORTS Men’s Soccer Championship, upending the reigning OUA champion York Lions 1-0 at Thunderbird Stadium. "We're going home with two wins and one loss, just like the team that will win silver, it’s just that we did it upside down,” said Citadins head coach Christophe Dutarte. “There's definitely some positive to take from this. Things got a bit stressful there at the end, but that's normal. All the teams that were here this week are proud and York wanted to give everything they had until the end." With a quick start on both sides, the first real chance of the match materialized at the 14-minute mark. UQAM’s Adair Chavez Melendez picked out Oussama Kouna running free down the right flank. The third-year winger took a few strides before testing Lions keeper Shyon Gaeeni with a rising strike. In the 25th minute, Eddie Lay tested Félix Audy-Favreau after stepping in off the left wing and firing a tricky shot that the Citadins netminder had to dive for in order to punch it out of harm’s way. It took a full team effort to get UQAM on the board first. In the 39th minute, Mohammed Saidi got his head on a terrific cross from Miary Rakoto, and as Gaeeni couldn’t corral the header, N’Diaye was in the perfect spot to smash the rebound into the upper left corner from in close. N’Diaye came within a whisper of potting a second goal midway through the second half. Taking a ball in off the right wing, the forward turned a let-go of a low rocket that handcuffed and made it through Gaeeni, but the Lions keeper did well to recover, turning and pulling the ball off the goal line. York had a shot at pulling even in the 80th minute, as a cross from the right corner found Omar Marzouk - who led the Lions with 14 regular season tallies - alone in front. However, the second-year just couldn’t connect on the volley attempt, putting the shot out of play past the left post. 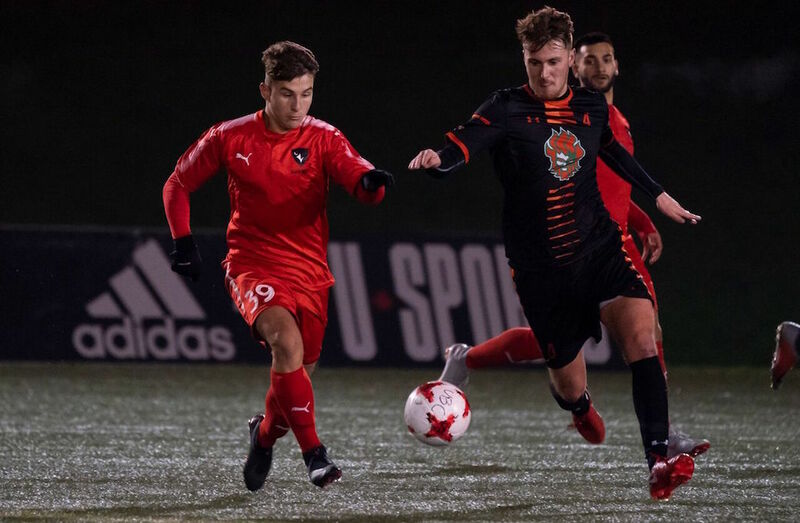 Steve Kloutsouniotis had the equalizer on his foot at the death, as a long ball in beat an on-rushing Audy-Favreau and found the York defender in behind, staring at a wide-open goal. The third-year midfielder just couldn’t get the ball under the bar, as the final whistle blew while the ball sailed out of bounds. M⚽️ // Congratulations to the Players of the Game from the @USPORTSca consolation final! "Overall, our experience in Vancouver was very positive,” said Dutarte. “We have a young team and that's good for the future of our program. It's encouraging." All that remains in the national tournament are the two final matches on Sunday, with the Carleton Ravens and Trinity Western Spartans taking the stage in the third-place matchup at 2:00 p.m. ET/11:00 a.m. PT. Then, the Montreal Carabins and Cape Breton Capers will go head-to-head for the second straight year in the championship final, with kickoff set for 5:00 p.m. ET/2:00 p.m. PT.